The Sashisena Temple was constructed by Biramitra Singhdeo to commemorate the eternal love between Sashisena, the princess of Amaravati and Ahimanikya the son of the minister of that kingdom. Also famous as the temple of Gayanadei maluani, this temple of Odisha is unique because it has no doors at all. 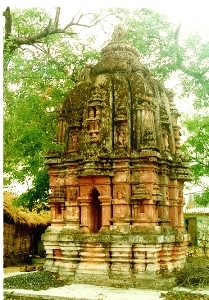 Once an important tantric monument, this temple is an important centre of Sakta practices.Sashisena Temple is a highly revered shrine situated at Sonepur, in Odisha. The temple was built by Biramitra Singhdeo to commemorate the eternal love between Sashisena, the princess of Amaravati and Ahimanikya the son of the minister of that kingdom. The temple is also known as the temple of Gayanadei Maluani, having no opening at all. Sashisena Temple now stands in memory of the Tantric practices that once flourished at Sonepur.